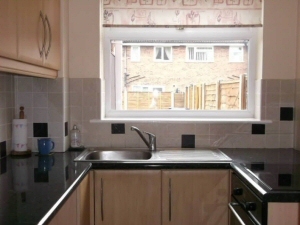 A small fitted kitchen for a terraced rental property in the Accrington area, near BlackburnKSW Services offer a comprehensive fitted kitchen and bathroom service, handling all aspects of work including plastering, tiling, joinery, plumbing and electrics. As we handle all necessary trades, it means you only need to deal with one company from start to finish and that means less stress for you. No waiting for one person to finish before calling another. 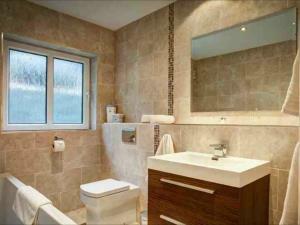 We understand that a bathroom or kitchen installation can create a big disruption to your daily routine. Wherever feasible, we will ensure you have running water and a flushing toilet by the end of the first day. We genuinely believe in a job well done, going the extra mile to ensure a good finish. For example, stripping kitchens and bathrooms back fully to get nice straight lines. All rubbish will be removed from your home, including your old kitchen units or bathroom suite. At the end of each day, we'll clean up after ourselves and at the end of the project, we'll leave you with a gleaming kitchen or bathroom ready for first use. Post installation, we offer a courtesy visit 28 days after completion to ensure everything has settled in well. In all cases, we can supply or install the customer's own products. We also offer a design service and can help choose fixtures and fittings to suit your property and available space. We'll help you work within your budget, whether you're looking for a simple functional installation or something high spec with a wow factor. If you're looking to add or renovate facilities at your commerical premises, KSW Services can help. Whether you require en-suite bathrooms within your hotel or guesthouse, shower rooms for a rest home, staff or customer toilets for a cafe, restaurant, shop or offices, please contact us for a competitive quote. All electrical and gas work will be signed off to Part P and Gas Safe standards and we're fully insured with public liability and professional indemnity. Written references can be provided on request. If required, we can provide our Fitted Kitchens and Bathrooms services as part of a full property refurbishment, whether it be for a rental property, preparing a house for sale or following a bereavement. For examples of our Fitted Kitchens and Bathrooms work, please take a look at our Photo Gallery page. Based in Penwortham, we offer Fitted Kitchens and Bathrooms services throughout the Preston area including Penwortham, Leyland, Chorley, Blackburn, Garstang, Bamber Bridge, Fulwood, Walton-le-Dale, Lea, Ingol, Ashton-on-Ribble, Longridge and Lostock Hall.